Portrait of a lady, watercolor of the early 20th, signed and dated, J. Bor 12 - 23 (December 1923), in general in good state of conservation. DIMENSIONS: paper H. 24 x 14,5 cm. - framed 33 x 24 cm. 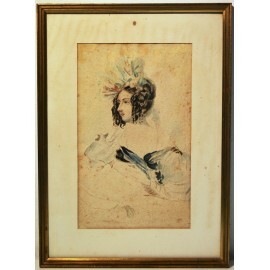 Antique portrait of a lady, watercolor on paper of the early twentieth century, signed and dated in the lower right corner, J. Bor 12 - 23 (December 1923), some points of oxidation of paper but in general in good state of conservation.